1. The property must be in good condition or will be with minor repairs that you are qualified to perform yourself or can afford to have done for you without exhausting your cash reserves. It is generally recommended that your repairs be limited to no more than the equivalent of 12 months of the property’s anticipated rental income – which is actually quite a stretch for a beginner. Wait until you get your feet wet before you start rehabilitating a property. 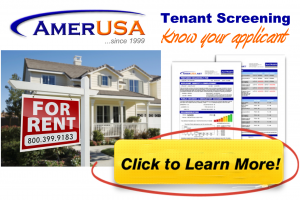 For those of you that are contractors or experienced flippers, you may skip ahead to the tenant screening articles. 2. The property must have the potential to appreciate. In other words, the local market condition cannot be overly distressed with foreclosures, toxic waste, sink holes, radioactive fallout or anything else that can potentially lower property values. Just make sure these values have gone up over the years by consulting a local appraiser or by simply ordering a comparable sales report from www.USHomeValue.com to see the difference in the property’s two previous sales transactions. 3. Your gross monthly rental income must at least equal your total monthly mortgage payment. If the monthly rent does not cover your mortgage payment – including the principal, interest, taxes and insurance – then your property must be able to appreciate at a considerable rate (usually seen in coastal or high-demand areas, where developable land is scarce). Unless you are a seasoned and experienced professional, it is not recommended that you take a considerable monthly loss on your rental just yet.